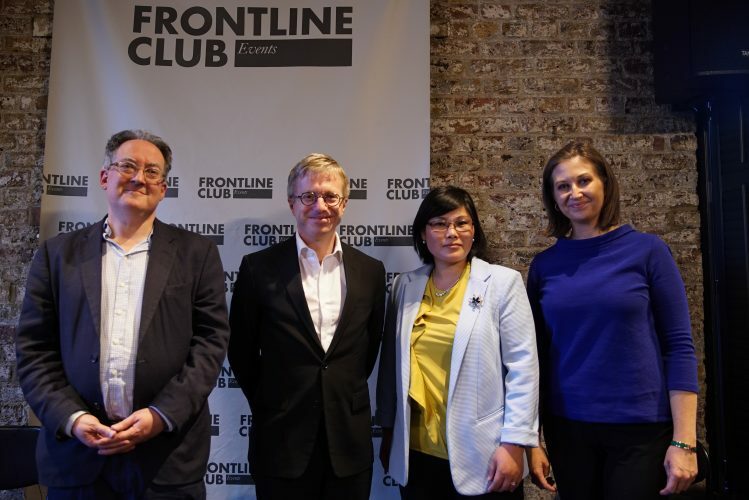 On Monday 11th June, the Frontline Club hosted a summit of its own in anticipation of the meeting between Donald Trump and Kim Jong-un in Singapore to discuss the matter of denuclearisation. As word breaks on Tuesday 12th June 2018, the two leaders have announced to the world a commitment to these aims. 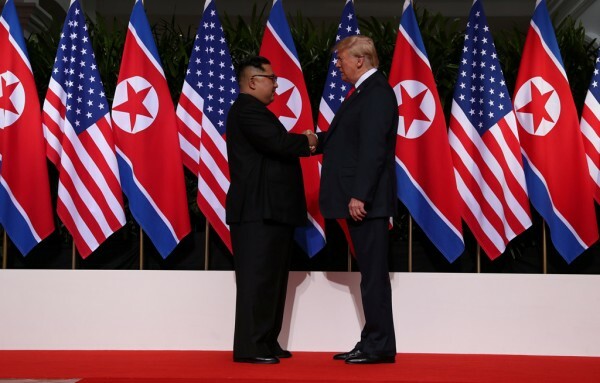 In many symbolic and headline-worthy pictures, the leaders are seen shaking hands and seemingly sincere announcements of ‘new US-DPRK relations’. Yet amid the fanfare, the accordance seems thin on the ground with the specifics of how these plans will be achieved. Our panel speculated and analysed the motives and outcomes of these talks. Opening up the discussion was chair Kimberley Leonard, World News anchor for Sky News. Asking both Gideon Rachman, chief foreign affairs columnist for the Financial Times and Dr John Nilsson-Wright, (senior research fellow for the Asia-Pacific Programme at Chatham House, senior university lecturer in Japanese Politics and International Relations at Cambridge University and an official fellow of Darwin College, Cambridge) how did they feel about this meeting taking place at all? There was consensus in the room that talking is better than inaction in order to bring about some form of security in the region. Both speakers expressed their worry was the lack of preparation from the American side. President Trump; the ‘great deal maker’ himself said there was not much need for extensive preparation for this meeting. On the other side, Kim Jong-un, widely seen as a very effective PR man, appeared to have prepared in great detail for this day. Dr Nilsson-Wright raised the question, what counts as a win on both sides? For Kim Jong-un simply showing up, meeting the most powerful man in the world was indeed a win. The stakes were higher on the US side, as there was public pressure for Trump to bring about something substantial, and deliver something no other President has achieved ahead of the US mid-terms. Yet there was some disagreement between the audience and the panel. Leonard asked is the meeting itself the message? Rachman argued there is a lot more on the table to discuss than a simple PR stunt. Comparisons were made to the meeting in Beijing 1972 between Chairman Mao and President Nixon. China-US relations had been frosty for many decades, so the visuals from this event were enough to mark it a success. However, objections in the audience may well have been right. If we view the realities of the agreement today, the most important message to people all over the world is the handshake in front of the two countries’ flags. The agreement is stubbornly vague. Critics might say however the outcome today was always going to be the case. Real peace will have a longer gestation period, after trust between the two countries has been built. 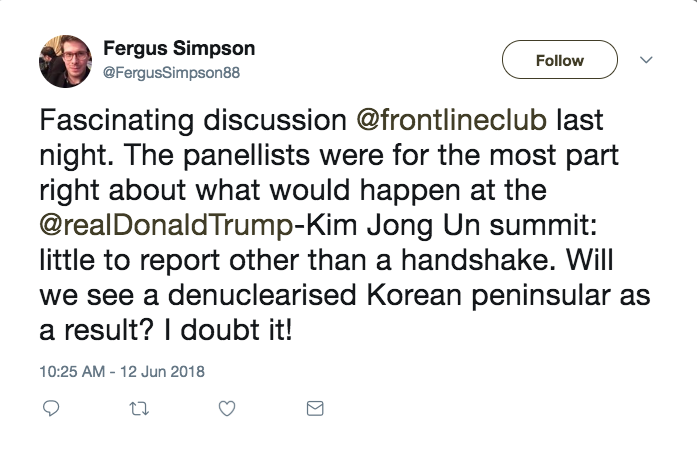 We’ve heard from foreign commentators for weeks now, in the run up to this summit. But rarely do we get to hear from North Koreans themselves. Jihyun Park is a North Korean refugee who has resettled in the UK. She is the North Korean Outreach and Project Officer at the European Alliance for Human Rights in North Korea. She gave the panel invaluable insight into the realities of the regime. When Park first saw the meeting between Moon Jae-in and Kim Jong-un in April 2018, her first reaction was anger. She was angry that Kim Jong-un could step so easily across the border, when for millions of North Koreans this is an impossible dream. While Park was hopeful for this meeting, perhaps her expectations did not reach up to reality. She stressed her hope that these talks could lift more of the sanctions imposed on North Korea. Trump, she stressed, is the only world leader that talks of the North Korean people and not just their weapons program and that gives them hope. Yet Trump did not raise the issue of human rights in the summit today. The message she wanted the audience to take home is that we should not forget who the real casualties in these political cat-and-mouse games are. Having survived a North Korean labour camp and escaping from the country twice; Park knows the real dangers of the totalitarian regime. We should not be deceived by Kim’s PR stunts. Members of the audience widened the scope of the talk. Questions around Russia were raised, what would Putin like to see happen from these talks? Rachman pondered Putin would like to see at least acknowledgment from either side of their involvement in the region. This falls in line with Russia’s determination to be seen as a global power by the West rather than a regional one. Dr Nilsson-Wright brought up in fact China is the nation that should be more concerned by these talks, being the neighbour of North Korea, it had high stakes for these two leaders to be left in a room alone together. The panel discussed the potential for world leaders, when left in a room alone together, to overcommit and over-promise to deals of peace in the heat of the moment. That has not been the case in Singapore. Commitments remain vague, and more negotiations are needed to clarify what the real meaning of denuclearisation means for both nations.